It’s an open secret that poker can be a very rewarding pastime. A gambler from Michigan can bear witness to that fact after winning big time at a gambling parlor in Atlantic City. The fortunate punter in question left a Mississippi Stud Poker table with a $250,000 jackpot in his pockets. A spokesperson for the Golden Nugget Atlantic City revealed that the Michigan man got lucky almost immediately after he had joined the table. The fortunate gambler took home the jackpot thanks to a royal flush. It remains unclear if Mississippi Stud Poker is his favorite game or if he also likes other casino games. Needless to say that the Michigan punter had lady luck on his side. Actually, the chance of winning the jackpot is one in 650,000. 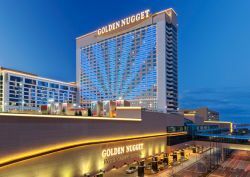 Golden Nugget Atlantic City seems to be a lucky gambling parlor as another visitor took home a staggering cash prize while spinning the reels of a slot machine only a few days ago. The fortunate winner, a woman from Absecon, New Jersey, bagged a $2.5 million jackpot.